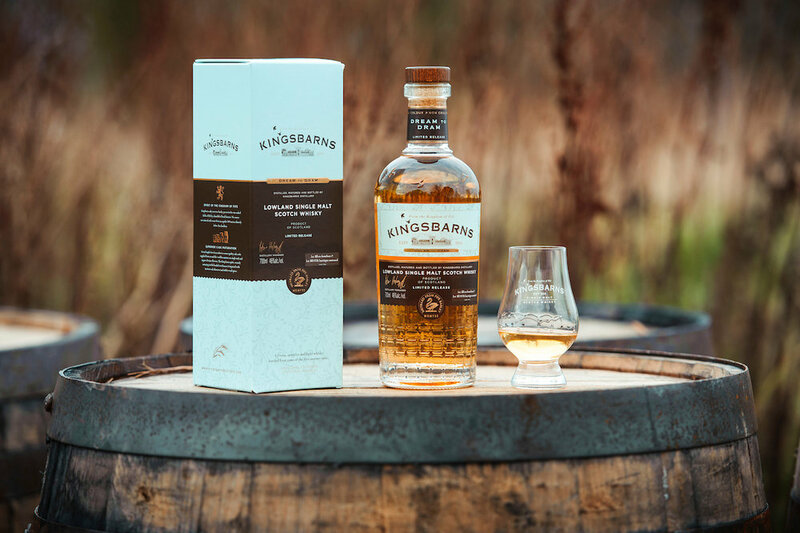 A long held dream to distil fine single malt whisky in the East Neuk of Fife becomes a reality this week for the founders of Kingsbarns Distillery, as they toast the launch of their first flagship expression: Kingsbarns ‘Dream to Dram’. Named to mark the Wemyss Family’s vision to bring malt whisky distilling to their Fife home, the new release is a truly local dram, having been slowly crafted with barley harvested exclusively from the golden fields of East Fife. The result is a beautifully light, clean yet complex Lowland style malt whisky which perfectly captures the essence of this quiet and enchanting corner of Scotland. Dream to Dram is packaged in gentle shades of blue, gold and brown to symbolise the natural elements of the East Neuk, with a pigeon motif representing the historic ‘doocot’ (Scots for dovecot) that sits at the heart of the distillery – a restored farm steading dating back to the 1800s. Today, owners William and Isabella Wemyss are gathering friends, neighbours and whisky lovers from around the world at the Distillery to celebrate and share a first taste of Dream to Dram as it is shipped global markets. The Wemyss family has lived and worked in Fife for generations and has a longstanding passion for whisky dating back to the 19th Century, continuing to this day with their successful Wemyss Malts range. Their long held dream however was to make fine single malt whisky in Fife. When approached by former professional Kingsbarns Golf Links caddy Douglas Clement in 2010 with the idea of converting the semi derelict B-listed farm steading at Kingsbarns into a new distillery for the ‘home of golf’, their dream began to take shape. After a three year restoration project which carefully retained the building’s ancient features and charm, the distillery was officially opened on St Andrew’s Day 2014, with the first whisky laid down in March 2015. The East Neuk enjoys high levels of sunshine, good soil and not too much rain, which creates the perfect growing conditions for barley. Every drop of Dream to Dram is made from barley harvested in these sun-soaked fields. The addition of pure, rich mineral water drawn from an aquifer 100 metres below the Distillery adds to the local character and light, fruity flavour profile of the whisky. A long, slow production process in copper pot stills is at the heart of distillation: a 3 – 5 day fermentation period, wash stills that run for 8 hours and a slow running spirit still with high cut points. That will never change and the stills will never run any faster. Maturation is primarily in high calibre first fill bourbon casks (90%), sourced exclusively from Heaven Hill in Kentucky by Isabella Wemyss, with the remainder maturing in shaved, toasted and re-charred wine casks. All Kingsbarns casks are matured in warehouses not far from the distillery in Fife. The natural elements on Kingsbarns Distillery’s doorstep, combined with superior wood choice and long, slow fermentation give Dream to Dram its remarkably complex and distinctive Lowland character: light, intensely fruity, floral and balanced, with colour and richness coming from the wood. On the nose there is banana, pineapple syrup and summer berries, with a slight herbal note. There is soft toffee, custard pastry and redcurrants on the palate, with a finish of ginger syrup. Dream to Dram is the first generally available single malt whisky from Kingsbarns Distillery. It follows a limited release of the exclusive ‘Founders Reserve’ for members of the Kingsbarns Distillery Founders Club in December 2018. Dream to Dram is bottled in 70cl at 46%, RRP £44.95. It is available from the Kingsbarns Distillery online shop and at specialist and independent outlets across the UK. 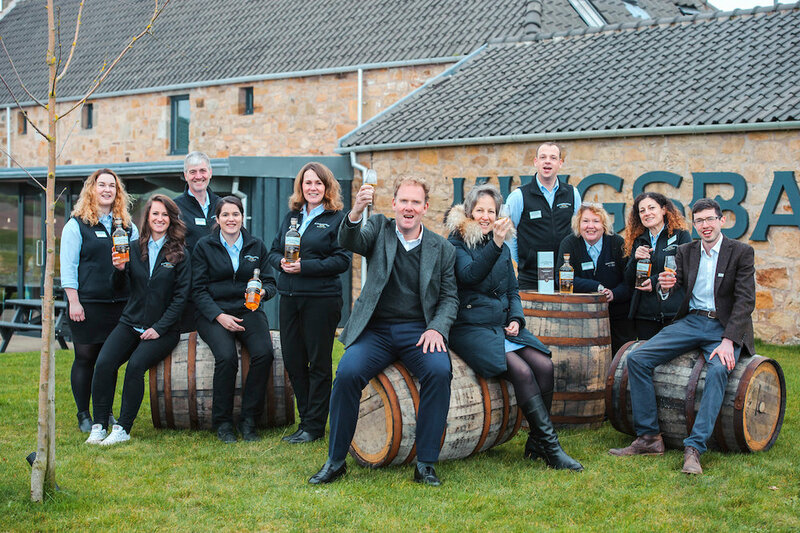 The Kingsbarns Distillery Founders’ Club was launched on the first anniversary of the Distillery on 30th November 2015 and is still open for membership. Members enjoy a welcome pack with a small bottle of Kingsbarns New Make Spirit, a glass and membership badge, plus five exclusive bottles of cask strength single malt whisky, including the distillery’s inaugural Founders’ Reserve expression. Wemyss Malts: Edinburgh based independent bottler, Wemyss Malts is owned by the Wemyss family. Their family seat is Wemyss Castle in Fife where they’ve lived since the 1300s. Wemyss Malts is primarily known for its award-winning range of blended malt Scotch Whisky which uses names inspired by the natural flavours and aromas of the whiskies: The Hive, Spice King and Peat Chimney. www.wemyssmalts.com. Darnley’s Gin: The family also own and produce Darnley’s Gin at the Kingsbarns Distillery site in Fife. Darnley’s Gin offers tours and tastings in a converted cottage with a Gin School where visitors can distil their own bottle of gin on a mini still www.darnleysgin.com. Rimauresq: to complete the drinks portfolio, the Wemyss Family own the premium wine estate of Rimauresq Cru Classé in Cotes de Provence www.rimauresq.eu. The new and improved Tennent's Story at Wellpark Brewery. Generally when you're invited to a brewery, of course you're going to say yes. When it's the Wellpark brewery and they are launching their new and improved visitor centre you definitely say yes. Wellpark is a piece of Strathclyde history, up there with the John Brown's yard or Ravenscraig. When you have 500 odd years of brewing experience to choose from the choice of what to put in a visitor centre is pretty extensive, especially when one of the products is the unmistakable indomitable Tennent's Lager. First brewed at Wellpark in 1885 this “madman's dream” has such a characterful history you can see why it was put front and centre. 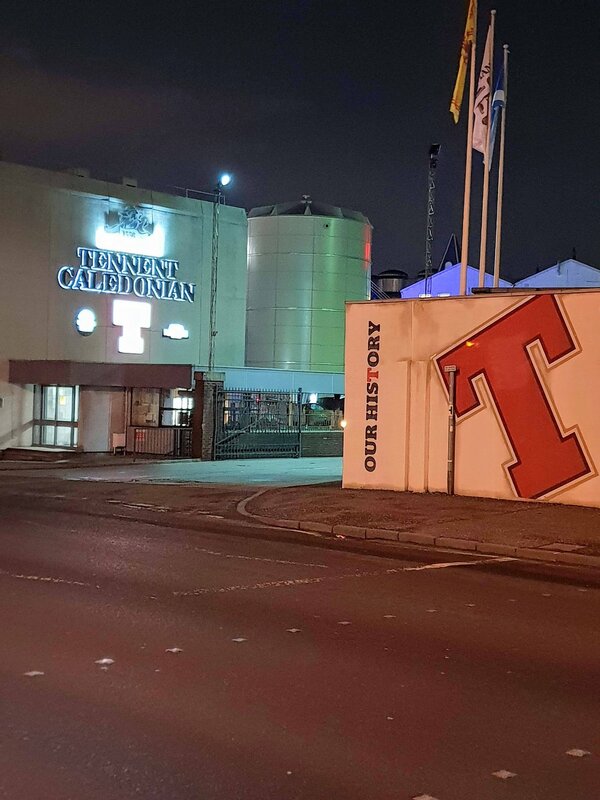 The Tennent's Story is full of interesting exhibits which will resonate with many. 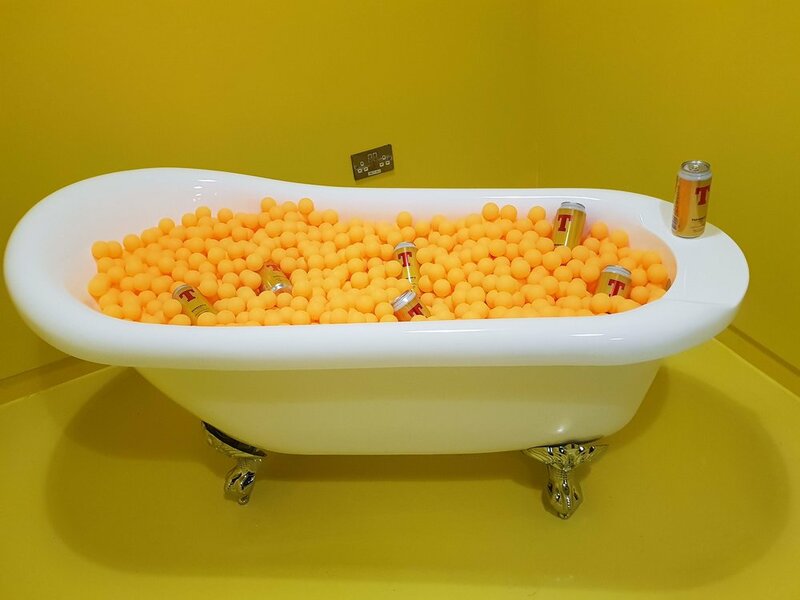 See which of the retro beer cans you remember drinki… ummm your mum or dad drinking from over the years, or watch as decades worth of old Tennent's TV adverts show on the big screen, some more politically correct than others! 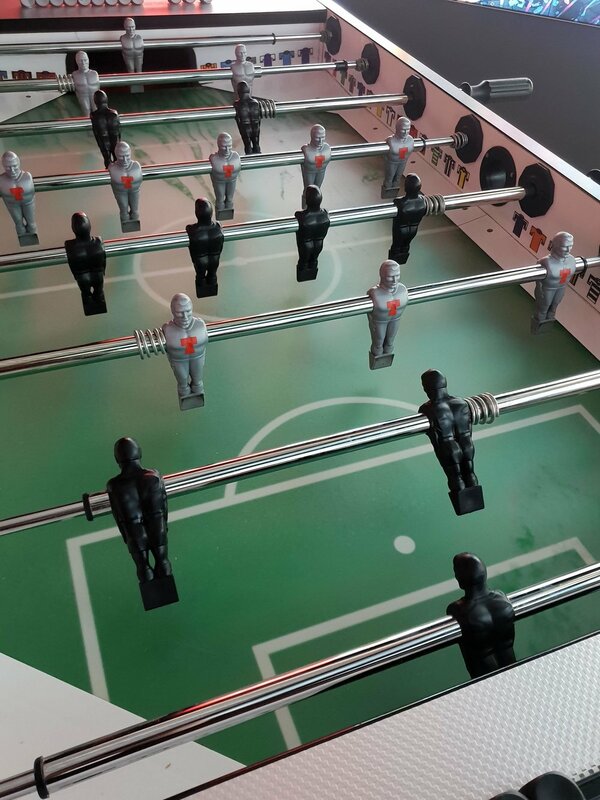 Then there's the fun to be had at the table football or the 8 bit arcade game, with the tin of beer ceiling above. You can book on to a tour of the brewery as well if you want to, pick up some quality merchandise and enjoy a pint direct from the tank. 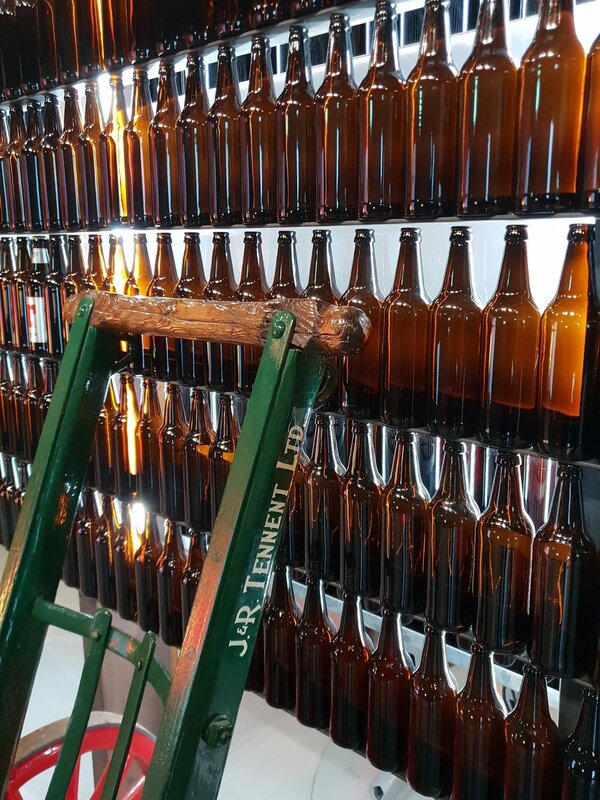 There's loads to see and do in this beer themed attraction so head to their website http://www.tennentstours.com for more details. Connage Highland Dairy has emerged triumphant after picking up another gold accolade for one of their cheeses at an international industry awards. The Connage Dunlop was awarded gold at the World Cheese Awards on the 2nd of November. The Guild of Fine Foods’ World Cheese Awards this year took place in Bergen, Norway, with 3,472 cheeses from more than 40 countries amongst the entries. All of the entries were judged in a single day by a team of more than 230 judges, and Connage’s Dunlop took home the gold in one of the hotly contested hard cheese categories. Their success at the World Cheese Awards is the third award for Connage this year. The Scottish cheesemakers won gold for their Clava Brie at the International Cheese Awards in the summer, and it was the Gouda flavoured with Cumin that took home Gold at the Artisan Cheese Awards back in May. The win comes hot on the heels of a successful trip to the USA, where co-owners Jill and Callum were showcasing their products in the USA as part of a wholesaler event to promote British produce in America. The event was organised by wholesaler Atalanta, who currently provide cheese to the Central Markets stores in Texas. As well as inviting producers to Texas, a group of the Central Markets store managers visited London and Gleneagles to visit producers and find out more about their products. Connage were amongst other British cheese producers, including Neal’s Yard and the Isle of Mull cheese company. Hearing that we’d won a Gold at the World Cheese Awards was fantastic. With so many cheeses there from all over the world, we were really pleased that our Dunlop managed to hold its own amongst the competition! We’re really proud of our cheeses and the hard work that goes into them, so being recognised for what we produce is just brilliant. Bells Food Group is giving foodies something to shout about this festive season with the launch of its premium Aberdeen Angus Steak Pie and delicious Hogmanay Steak Pies. Scotland’s leading pie and pastry manufacturer has unveiled the mouth-watering pies ahead of Christmas with brand new premium window packaging. The dedicated team at Bells has introduced a special cooking method which sees their signature pies braised slowly and tenderly, for a melt-in-the-mouth experience. The brand new Aberdeen Angus Steak Pie is perfect for families this Christmas and the Hogmanay Steak Pie is a delicious, hearty way to bring in the bells. Both pies are packed with succulent, select cuts of beef, with a rich and flavourful gravy, hand finished with Bells Special Puff Pastry. A savoury delight not-to-be-missed, the Hogmanay pies are available now in 1.1kg and 1.7kg packs, enough to feed a large family. 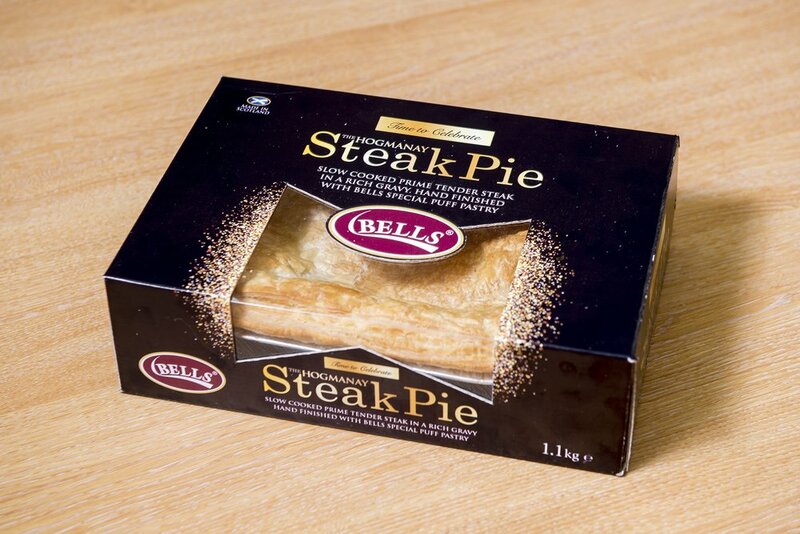 The Bell family has been producing steak pies for three generations and we work hard to constantly improve our traditional recipes and cooking processes at the factory in Shotts. The number of pies expected to fly off the shelves this December would reach four times the height of Ben Nevis and be as tall as around 10,000 six foot Christmas trees. The Shotts based firm has taken on 20 additional staff members to keep up with demand. The Hogmanay Steak Pies and Aberdeen Angus Steak Pies are widely available in supermarkets throughout Scotland.